Looking for the best recliner sofa to spend your money on? There are two ways to put your feet up: figuratively, and literally. And while the former, with all its email-silencing, gin-sipping, blanket-donning implications can be just as good, we have a bit of a soft spot for the latter. That’s why we’ve been having a think about what makes the best recliner sofas, so that you can get in on it too. Use our guide to choosing a new sofa to make sure you shop for a quality buy that's right for you and your space. Find the latest sofa deals for a bargain, too. In the first instance, that means finding a recliner sofa that’ll work for you and your living room in practical terms. Depending on the size and design of your living room, plus the size of your family, you may want to go for a two seater, a three seater, or even an oversized corner unit that gives everyone room to pile on (although fair warning, you may regret that one when you wind up with stinky socks or dog breath in your personal space!). Your choice of reclining mechanism comes down to manual or electric, so the main thing you’ll need to think about is whether you’d rather use the hopefully infinite resource of your own elbow grease, or save yourself a little strain with an interior motor. The other big choice is sofa fabric (see our guide for tips on that). 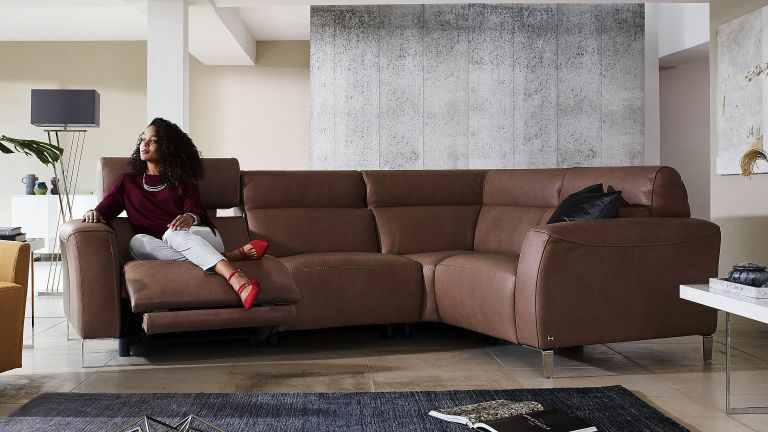 Most recliner sofas on the market tend to be made out of leather, and we can’t say we’re surprised – there’s just something so luxurious about the look and feel of a natural leather sofa (see our buyer's guide to the best leather sofas for more). It’s not just brown or black anymore though, and our picks come in a rainbow of shades from traditional deep chestnut to trendy cognac, contemporary white to decadent oxblood. However, if you’re putting your reclining sofa in a room that varies in temperature, such as a conservatory or draughty period living room, leather may not be the best choice as it tends to feel sticky on hot days and chilly on colder ones. If that’s the case, or you simply prefer the look and feel of woven fabric, our G Plan and John Lewis picks, below, offer lots of different designs to choose from with nary a tanned hide in sight. This reclining chaise sofa offers all manner of options for ultimate relaxation. The ‘power headrests’ sit flat to the top of the individually reclining seats when not in use, giving the sofa a low-profile, elegant look, and then cleverly emerge when the touch sensitive dual motor power recliners are activated. The inclusion of a longer chaise element makes this one for proper weekend slobbing, giving you full license to stretch out when a lean-back recliner just isn’t quite cutting it. In terms of looks, we think this is the best recliner sofa you can buy. If you’re looking for a recliner sofa that doesn’t look like a recliner sofa, this elegant unit might be worth some consideration. The recliner corner sofa isn’t the most common configuration out there, but if you have a large family or entertain frequently, and find yourself a bit stuck for space, it’s ideal. This sofa shares the power headrests and low-effort reclining of our first pick, but ups the capacity, and nixes any potential bulkiness with dainty tapered feet that create visual space underneath. Not your average chunky recliner, this modern two-seater is ideal for those who want to kick their feet back after work but don't want to throw away the modern look in their living room. Made using Italian parts and soft grey fabric, the clean and classic design is available in two different shades of grey: light and dark. Its electric touch sensitive steel buttons are discreetly positioned in the framework so guests won't notice a thing. Luxury lounging at its finest? The best recliner sofa for comfort, we think. What was that we were saying about recliners that don’t look like recliners? For a low-key addition to the living room, this retro three-seater sofa ticks all the boxes. The very definition of sleek, its low profile seats extend at the headrest and footrest for a surprisingly expansive recline, but you’d never know it when it gets popped back into place. We’re quite taken with the ‘honey yellow’ cognac shade, and the angular silver feet are a delightful and unusual touch. The only non-leather option on our list, this large three-seater G Plan Sofa is the best recliner sofa choice for more traditional or rustic schemes. The speckled tweed-look fabric in a range of calming colours adds texture and interest and, a far cry from leather, feels warmer and cosier to the touch on those cold days when you want nothing more than to kick back in front of the TV. The seat back cushions come up higher than you might expect, but this offers consistent support along the whole length of the spine for ultimate comfort. With a frankly ridiculous number of colours, patterns and fabrics to choose from, this John Lewis sofa is the ultimate customisable recliner. From beautifully saturated solid shades to reserved traditional checks, sumptuous wool or velvet to stately jacquard, there are hundreds of ways to make it your own, meaning it really is ideal for every space. Other than that, it’s reasonably straightforward! It’s simple and neat with room for two, and like our G Plan sofa, it has higher than average back cushions which are generously filled for support and comfort. If you are working with a small living room, but don't want to miss out on the supreme comfort of a reclining sofa, this one could be for you. It's only 156cm wide so we reckon that it could squeeze into most living rooms. Both seats recline, so no arguments, and the design definitely nods to the Mid-century style that very on-trend right now. Still looking for more sofa advice?